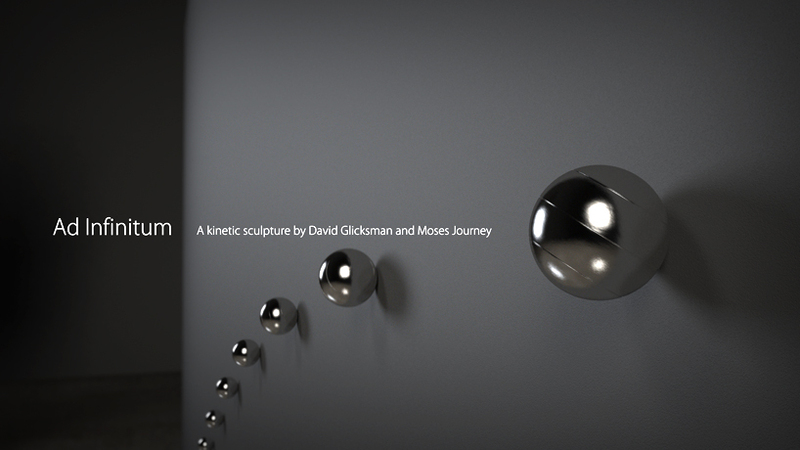 Ad Infinitum is a kinetic sculpture that my good friend Moses Journey and I designed for the 2012 Infiniti Digital Art Competition. I made this video as part of our proposal and, with any luck, I’ll be building the real thing as well. Ad Infinitum consists of eight large, polished steel spheres arranged in a row, which roll up and down the surface of a freestanding wall, seemingly of their own accord. As individual elements, each ball is pretty mesmerizing to watch – but when they move in concert with one another, the individual points coalesce into larger forms. A video projector overlays various subtle enhancements, and together the sculpture generates sine waves, wind tunnels, abstract forms, and – because I’m trying to win a corporate sponsored contest here – the silhouettes of Infiniti’s cars. [jwplayer width=960 height=540 image=”http://appliedesoterics.com/goodies/AdInfinitum_Resolve.jpg” file=”http://www.appliedesoterics.com/goodies/AdInfinitum_v011.m4v”] The sculpture itself is built out of motion controlled linear rails with powerful rare-earth magnets to hold the balls in place and roll them up and down the walls, while the rails and projector both are controlled by code I’m writing in the Processing development environment. Wish me luck!